Cuts and scrapes occur when one or more layers of skin are torn or scraped off. This happens so often that it may seem unimportant. However, scrapes and abrasions should be treated to reduce the chance of infection or scarring. A cut, dirty scrape or puncture wound is a good reason to check immunization records and to make sure tetanus shots are up to date. Minor cuts damage only the skin and the fatty tissue beneath it. They usually heal without permanent damage. More serious cuts may damage muscles, tendons, blood vessels, ligaments, or nerves. A doctor should examine serious cuts. A puncture wound is a small but deep hole produced by a sharp object such as a pin, nail, tack, needle, tooth, or fang. What is the treatment for a cut? Press on the wound hard enough to stop the bleeding. Do not let up on the pressure, even to change cloths. Just add a clean cloth over the original one. Raise the wound above heart level, unless this is painful. Get medical help right away if blood spurts from a wound or bleeding does not stop after several minutes of pressure. Wash the cut with soap and water. Avoid hydrogen peroxide, alcohol, mercurochrome, Merthiolate, or iodine, as they are not necessary, can be very painful and can delay healing. Make sure no dirt, glass, or foreign material remains in the wound. Call the doctor if a cut or wound does not heal in 10 to 14 days. Bandage a cut when its edges tend to fall together and when the cut is not very deep. Use "butterfly bandages," strips of sterile paper tape, or adhesive strip bandages to keep edges together. Apply the bandage crosswise, not lengthwise. This will bring the edges of the wound into firm contact and promote healing. Moist wounds heal faster and with less scar tissue than dry wounds. The scab that is formed by dry healing interferes with the movement of skin cells. Apply antibiotics ointment to keep the wound moist and soft. When are stitches needed for a cut? the wound is deep, gapes, is very dirty or irregular, or can't be held together with a bandage. A deep cut is usually located on an elbow, knee, finger, or other area that bends. Scrapes are usually caused by falls onto the hands, knees, or elbows. This exposes nerve endings, all of which carry pain impulses to the brain. Because scrapes can affect so many nerve endings, they are usually much more painful than cuts. Although most abrasions and scrapes can be treated at home, you should call your doctor if they become infected. What is the treatment for a scrape? It is important to carefully clean scrapes to help prevent infection. Wash your hands before washing wounds, and then carefully remove all dirt and debris. Use soap and warm water to thoroughly scrub the scrape for at least 5 minutes. Liquid soap provides better cleansing penetration. Use Vaseline to remove tar from wounds and wet gauze to "tease" gravel or dirt from the abrasion. Avoid antiseptic agents such as alcohol, Merthiolate, iodine, mercurochrome, or hydrogen peroxide. They do little good and cause stinging. Next, apply direct pressure to the scrape, using non-stick gauze or a clean cloth to hold on the scrape and stop the flow of blood. If the gauze or cloth becomes soaked with blood, do not remove it. Instead, place another clean layer of cloth or gauze directly on top and reapply pressure. Because blood takes time to clot, you may have to apply pressure for 5 to 10 minutes. Raising the scrape above the level of the heart will also help reduce the blood flow. If you cannot control the bleeding, see the doctor. Within 24 hours, remove the bandage and wash the area with mild soap and running water. The wound should be washed daily with plain tap water and soap. 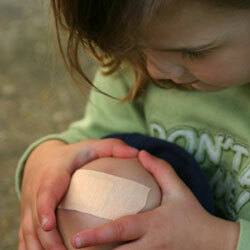 Use antibiotic ointment to keep the skin flexible and prevent the formation of a scab, which can slow healing. Change bandages two to three times daily. The cut is caused by an obviously dirty object, such as a rusty nail or shovel point; a foreign object is embedded in the wound; or debris is in the wound. A tetanus booster may be needed. There are signs of shock. There is a puncture wound or cut on the head, chest, abdomen, or over a joint.